One of my long-term objectives is to update my sound system. My current system is a mix of devices collected over many years. The horrible old brown Sanyo speakers I’ve had since I was a teenager, which originally came with a Sanyo DC J3K receiver and turntable (click through for some photos of what this looked like… some still survive to this day, obviously — though my speakers are bigger and I think browner than that). I think I paid about $120 secondhand for it in about 1986 — it replaced a white plastic turntable I’d had previously which was probably from the 70s — not sure, but that one was old enough that it could play 78s. A Technics SA-EX300 receiver that I think I got in the mid-90s when the Sanyo amplifier died. At that point the turntable had to be ditched too, but I’d started switching to compact discs in 1988 after buying a CD player, so it was no big deal. The receiver theoretically does Dolby Pro-logic surround sound, but I’ve never used it for that, and I assume it’s not compatible with modern surround sound encoding. Most of my music plays off my nine-year-old 40 gigabyte iPod, plugged via an iPod dock and 3.5mm cable into the back of the receiver. Combined, these three devices put out a reasonable sound for a small room/house. The sound quality isn’t half bad, but certainly isn’t as crisp as newer, better systems. Newer, better equipment will mean better sound quality. It’d be great to have surround sound, particularly for TV/movies. I pondered this some years ago but didn’t act on it. It’d be nice to have reliable radio, including digital radio such as Double-J. The receiver is of course analogue only, and the reception is pretty poor, as it has no proper aerial, and nowhere convenient to put it. Playing music and/or radio in the kitchen (without blasting it all around the house) would be a good bonus. You can buy speakers of various types, and scatter them around your house. They are smart — they must have little computers inside them. Together they form a wireless network of their own and play music in sync between them. They can interface to your LAN and play the media collection on your computer(s) or a NAS drive, and you can control them using an app for iOS or Android, and play music directly from those devices too. And they can play internet radio stations, including the online versions of all the local stations. Sonos make various sizes of speaker, and some of them can be plugged into other hifi gear… for instance their soundbar can be connected to a TV with optical audio out. Their Play5 large speaker has analogue audio in, for older devices. 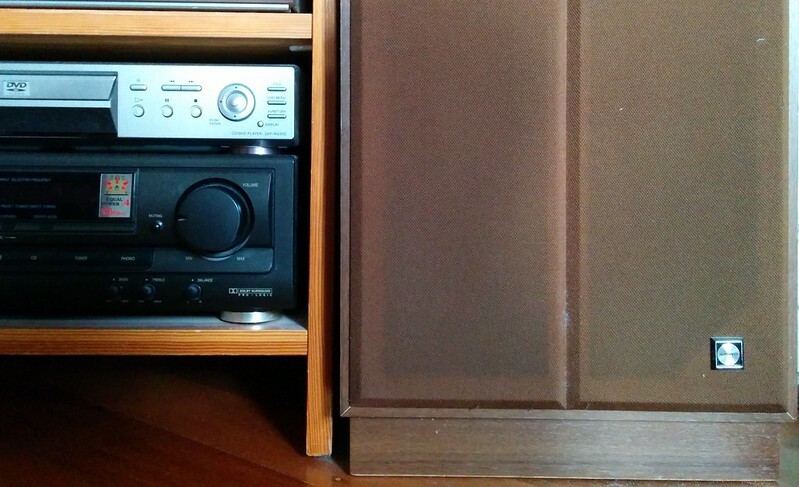 Speakers can be paired to provide stereo — some of the larger versions have stereo within the one speaker, but this is obviously limited. You can combine a soundbar, a sub-woofer and two smaller speakers to form a surround 5.1 setup. It’s all very neat, if a little pricey (though not in the grand scheme of quality hifi equipment). But you can buy bits and bobs gradually and build it up. Some of the Sonos gear is available through Commonwealth credit card and Qantas Frequent Flyer points — I have heaps of the former (enough to get a Play:5 or a couple of Play:1s), and a small amount of the latter. Niggling doubt: will all their stuff keep running and be supported in 20+ years time like my current old speakers, which keep just working? They seem heavily dependent on compatibility with a home network, and handheld devices, as well as software maintenance from Sonos themselves. It’d be lovely if there was a surround sound setup made by one of the reputable brands that was expandable like the Sonos system is. A surround setup with Sonos gear would be extremely expensive (about $1700 just to get the basics — though $700 of that could be got on points), and for me that’s probably a higher priority than cool networked music and internet radio. There are a few rather nice home theatre kits that do similar things, such as from Yamaha — but these aren’t as smart and expandable into the rest of the house later. When I say surround sound is a priority… well, as much as any of this is a priority of course… all this stuff is the very definition of discretionary, unnecessary spending. What I love about my blog is I can post on topics I know not too much about, and have all sorts of informed people commenting with good advice and ideas. So, no pressure, but over to you! I’ve been thinking about Sonos vs a Yamaha home theatre package, one of the ones with networking capability, so either option will play from a NAS or internet radio. Great for multi-room which is so very cool, not so good for surround/theatre (no DTS, for instance, and more expensive). I have checked – my TV will output the 5.1 signal via the Optical Out which the Sonos Playbar needs. Does it phone home? Would a Sonos system keep working if the company went bust? This may sound alarmist, but I’m pondering if the system will keep running 10, 20 years in the future. Maybe I should ask on the Sonos forum about this. Sonos devices use a fair bit of juice even when inactive/on standby. The playbar alone uses 13 watts when not doing anything. Hmm, it seems Jongo is a Sonos competitor. Probably similar issues. Less good on multi-room. Even the setups which handle Zone 2/Zone B are really tied to one additional room, not many. Uses far less juice when on standby. I’m leaning towards the latter option, perhaps complemented by a DAB radio for the kitchen, for instance for playing Double J. Are there some good ones that might also have network capabilities? Or is that getting back to the Sonos gear and internet radio? Some might at least have bluetooth — eg Pure have some of these, for instance the Pure Contour, though of course it couldn’t be in sync with the livingroom setup. If only home theatre setups had a way of broadcasting to remote speakers elsewhere in the house. Is there a device that will do that? Or do you have to wire everything up? Or you could use Sonos gear to hook into that I suppose. Well I reckon you’re right – Sonos would be a very expensive way to achieve surround sound. Instead, I’d recommend using a conventional set of speakers and a surround receiver to run the surround sound, and make sure they’re good enough to sound good to you when playing stereo music. Then, get one of the Sonos Connect units that can send a signal into a normal amplifier. You will then be able to use Sonos to control music, play to as many Sonos units as you like (if you buy more for other rooms) and play through your stereo/surround amplifier and speakers. Those Connect units are over $500 by themselves though, so you’re paying a lot for the Sonos transmission and control system. I predict that you will tire of surround sound when listening to music. Music is recorded to sound good in stereo, and it does. But when converted to surround sound, it loses some of its impact and is really a gimmick, in my opinion. But surround sound is great for TV and movies so I recommend having it there. Digital radio is available on a lot of surround receivers, and some of them will pick up internet radio as well (you connect them to your home network and they do the rest). The biggest improvement in your sound will probably be to replace your old speakers. They will be pretty tired by now. Yeah the Sonos Connect is almost as expensive as a Play:5! And the Play:5 includes audio in, so you could potentially plug an existing setup into it. And yes, I suspect the speakers are the weakest link in the current setup. Oh and the Sonos should continue to work into the future as long as Sonos doesn’t decide to cripple it and stop it working. It uses its own wireless network, not your home wi-fi network. Apple Airplay works over the wi-fi network but is still reliable in my experience, though I do have one faulty Airport Express unit which was sold to me second-hand by an unscrupulous person on eBay. I don’t know what other systems are available, but you can pretty much create a remote-controlled, multi-room setup from separate components; you don’t need to rely on a proprietary product like Sonos. I still have the same Teac Hifi system I got back when I was 21. That is 21 years ago. The turntable seems to have finally given up for good just recently. I have given away the CD deck and the cassette deck has only been used five times since I purchased it. The radio and turntable get almost daily use. I gave away my CD deck to my dad, his 1970s HIFI did not come with a CD deck. I have a Lazer Disc player which can play CDs anyway. While I am here, does anyone know of a good place to buy a new record player deck? I would buy one at Audio Trends in Ringwood. A basic turntable can be had for between $350 and 500. We have a Sonos system and we love it. We get access to our hundreds of CDs ripped onto a USB stick plugged into our router, and also internet radio, all accessible via an easy user interface on all our portable devices. It has a high WAF (wife acceptance factor) and is far easier to use than our 7.2 surround sound system. I wouldn’t use Sonos components for surround sound as they are too expensive. If you were fussy about sound quality you’d be better spending your money on a Sonos amplifier connected to two quality non-Sonos speakers. Get a Sonos. You won’t regret it; had one for 2 years and never looked back. Great interface on ipad app or phone app, can play spotify and digital radio; it can also play podcasts off your phone etc. For the original poster and those replying that might consider Sonos for surround, bear in mind that most combinations and peoples situations will not produce surround sound, just stereo across as many speakers as you like. Ie, no noises coming from behind you only. Also, the wish list item “newer will mean better’ is not true for HiFi. Good stuff from the 70’s is still better than most of what you can buy now. The current stuff better than what everyone had in the 70’s is much more expensive than your price ranges. I like Sonos, but it’s value is just convenience, ease of use and the ‘Wife Acceptance Factor’ with acceptable sound quality. If your mission is really about quality, you still buy something else for the same money and it’s not hard to hear the difference.